While in today’s world most check their phones to see the time, many are still fond of using watches. These devices are not only stylish, but many are made with unique features, like the ability to make phone calls. They are able to mix the old and the new together in a unique way. However, what many will find is that some smartwatches can be very expensive. This is due to the materials they are constructed out of and the intricate settings built into them. Despite this, many often are willing to invest large amounts of money in them. If you’re on the search for a pricey smartwatch or are just curious about them, you’ll want to keep reading. Below you’ll find more information about these gadgets and some of the most expensive and sought-after options in the world. A smartwatch is worn like a traditional watch, but it contains many more features. This watch is basically a wearable touchscreen device which allows you to browse emails, make phone calls, and download other various apps. When you’re done using it to check things, you can exit out of the interface and turn the digital clock back on. To charge a smartwatch up, most come with magnetic chargers which let you place the watch on a small pad to charge the battery rather than plug it in. Surprisingly, there are many benefits that come with investing in a smartwatch, no matter what its price is. Below are some you’ll find with them. One of the best things about smartwatches is that they are created to be durable. Despite their stylish looks, these devices can withstand heavy-duty work. In fact, you can even use them for fitness tracking without worries of sweat or dirt ruining it. Some models are even water-resistant and can be submerged a few feet into the water. This means if you accidentally get caught in the rain or want to go swimming, you won’t have to worry about the water destroying the interior. Many also come with special casings and lenses which can help to prevent the screen from scratching. Smartwatches not only work as a way to help tell you the time, but can let you make phone calls as well. You just need to use the touchscreen to type in the phone number or use the video chat option if you want to make a face-to-face call. Another great benefit about smartwatches is that they come in numerous styles. You’ll find everything from sporty models to more luxurious ones. This means anyone can find one that fits their needs perfectly. When you buy a traditional watch, you’re usually stuck with that specific design forever. However, with a smartwatch, you can change the screen to have certain looks and features depending on your preferences during that time. Sometimes you can turn on settings that will change the watch’s face every day so something new always shows up on your screen. Many models also come with interchangeable bands so you can change the style of the watch yourself. For many digital devices, one of the main problems is the battery life. The battery can go by very quickly, even when you’re not using the device. However, smartwatches have an efficient built-in battery which is designed to stay on for hours without you needing to rush to a charger. Some models can even stay on for a few days before you need to charge them back up. When it does come time for you to charge the watch, most chargers will fill the battery up within an hour so you don’t have to wait around for it. Another interesting thing about smartwatches is that many of them can automatically adjust to your current setting. This means they can change the time zone, lighting of the screen, and GPS tracking system without you having to do anything. While smartwatches come with plenty of benefits, there are a few things you’ll want to keep in mind before you buy one. One of the most important things to consider about these gadgets is what you plan to use it for. Do you want something fashionable or are you looking for a heavy-duty model for fitness activities? It’s important to consider this as some smartwatches are designed to be only worn for certain purposes. Otherwise, your substantial investment might end up quickly becoming destroyed or not working well for you. For some smartwatches, they only connect with certain phone models. For instance, if you invest in an Apple smartwatch, it will only sync to an iPhone. This is a vital thing to check as your new watch might end up not allowing you to make calls or send information to your phone. In fact, you might not be able to use your new smartwatch at all if it can’t connect with your smartphone. Another thing to consider is whether you want a touchscreen or button model. Many expensive smartwatches will usually come with a touchscreen which can make it easier for you to reach certain information faster. However, some will only have buttons on the side in order to sort through apps which might take some time. If you plan to use your smartwatch often, it’s bound to come into contact with things, especially if you’re wearing it outdoors. Because of this, it’s ideal to ensure the smartwatch has a scratchless lens to help make sure its looks and interior aren’t ruined. One material to look for to help prevent scratches is sapphire glass. This glass is almost stronger than diamonds when it comes to being scratch resistant thanks to the heavy amount of aluminum oxide in it. Why are Some Smartwatches so Expensive? You’ll find that some smartwatches can be very pricey and for a few reasons. The first is that pricey models tend to be made of precious materials, like gems and gold. In fact, some smartwatches can be encrusted in diamonds or covered in 24k gold. Because of this, the price tends to be very high. Another reason the price tag can be a little shocking is because of the features built into the watch. The higher the price, the more features the smartwatch will usually have, like a built-in payment system and time zone apps. The last reasons why many of these devices can be expensive is their screen size. For some models, you can buy a very large touchscreen for your watch. This is ideal for those who want to watch movies on it or do video chats. However, this large size comes at a price as it needs to be configured to ensure it works well for your needs. This model by Apple comes at a high price, but this is due to its wide variety of features. The watch is made with a 44mm face and has an extravagant sapphire crystal backing. To attach the watch to your wrist, this model comes with a leather buckle which can also be exchanged with an orange sport band that’s provided for those who plan to be active with the watch. The band then connects with a durable and water-resistant stainless steel case. 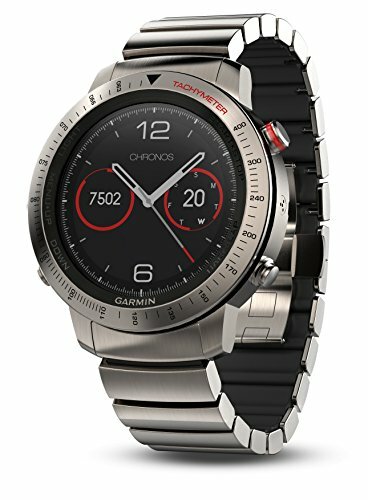 Some unique settings this smartwatch model comes with is a Galileo GPS system, barometric altimeter, gyroscope, 16GB memory, and a loudspeaker. You’ll also find a heart sensor you can turn on when you want to monitor your heart rate. The watch can go up to 18 hours before needing to be charged back up again with its magnetic charging cable. The Samsung Galaxy Watch is designed to mimic a traditional watch thanks to the moving hand that ticks when it revolves. The front is also made to have a lighting effect which either dims or brightens up the watch up depending on the area you are in. This smartwatch comes in 42mm and 46mm options and coatings such as black, silver, and rose gold. The band attached is also made to be durable but stretch a bit to help make it easier for you to wear. However, you can easily customize the band and casing depending on your preferences. Besides its looks, the watch also is packed with features. You can use voice control to open certain apps, play music, check the weather, or make phone calls. It also has plenty of fitness tracking settings you can use, such as a sleep pattern tracker, progress indicator, and heart rate monitor. 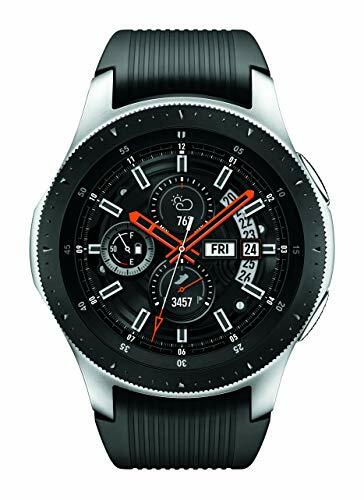 The watch additionally has an Always On feature which ensures the watch never turns off helping to prevent you from constantly having to press a button to check things. When you need to charge it back up, you can use its sleek wireless charging dock. 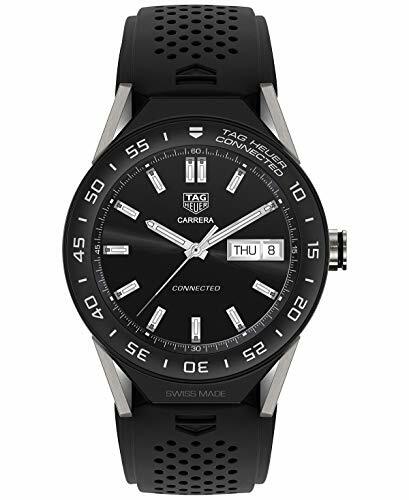 Tag Heuer, a Swiss company, is known through the globe for its impressive watches, especially its expensive Tag Heuer Connected 45 Modular. This model features a sleek AMOLED screen which has a unique lighting feature built into it. This screen will be able to sense different lighting changes depending on the space you’re in so you can easily see the screen. The back of this watch is made with scratch-resistant ceramic and can be attached to a band of your choice: black, titanium, diamond, or leather. You can also choose to have the dials and interface customized so it fits your taste. This lightweight watch has a 25-hour battery life and can connect to Bluetooth. This device also syncs with apps such as Google Translate, Google Play Music, and Google Pay. There’s also a built-in GPS system you can use. The Samsung de Grisogono is a stunning smartwatch featuring over 127 black and white diamonds encrusted on a rose gold casing, including a shiny row of them on the bezel. At first glance, the watch might seem like a traditional option with its two dials, built-in date, and moon phase settings. However, with the touch of a button, it easily transforms into a smart device. The screen will display a handful of apps you can choose from, like music and a heart monitor. You can also have the watch send you alerts. This option also has an ambient light setting which will change the brightness of the screen depending on the area you’re currently in. The Brikk Lux Omni Watch is one of the most high-priced smartwatches in the world due to its shiny diamond-encrusted exterior. The watch also lets you choose from a yellow, rose gold, or platinum surface to attach the diamonds to. To ensure that the diamonds you have bought are authentic, the watch also comes with a certificate of authenticity. In addition to its looks, this watch is also pretty pricey thanks to its large face which comes in 38mm and 42mm options. To keep the watch attached to you, there is a durable golden band sewn into its edges. This band is not only stylish, but designed to be comfortable for you to wear as well. This product also comes with a case you can keep your watch in to help protect it when you’re not wearing it. This model is ideal for those who want something fashionable to add to their wardrobe, not necessarily someone who wants a smartwatch to help them with their fitness activities. The Tambour Horizon model by legendary fashion company Louis Vuitton is one of the most customizable smartwatches available. You can pick the colors and initials you want on your watch, as well as if you want an analog or digital display. In addition to this, you also have the choice of various backgrounds, like Monogram White or Damier Cobalt. Besides its personalization features, there are also many useful built-in settings. You’ll find plenty of apps you can try out, like MyTravel, which can help you to keep track of your flights and hotels when on the go. You’ll also discover over 24 different time zone options you can use and detailed weather information – all with just the tap of a button. This compact smartwatch by Mondaine comes in a unique minimalist style. It’s constructed with a shiny black casing and has a stunning anti-reflective sapphire glass cover. This model also has a smooth leather strap you can use to help secure the watch to your wrist. The watch has a 44mm screen which you can use to check the date, receive alerts, and even to track your sleep patterns. You’ll find plenty of other settings you can use as well, such as music and GPS systems. However, keep in mind this watch only connects with Android 4.4 and iOS 8 phones. Garmin Fēnix is a company known for making exquisite yet durable watches. Their Chronos model might be expensive, but it’s ideal for those who are active yet want to be in style while doing so. This model features a sleek titanium band and a scratchless lens that can withstand many different types of impacts. It also has a Garmin Chroma Display which helps to illuminate the screen so you can see it better. Built into the watch is a durable battery which can last for up 8 days before needing to be charged up. It also has a GPS with a 3-axis compass and alert settings you can use. This water-resistant watch can also be used with various types of sports, like golf, running, cycling, and rowing. It will help you to track various aspects of these sports, like your running speed and oxygen intake. Montblanc is a German company renowned for its inventions in the watchmaking industry. In fact, its Montblanc Timewalker is one of the first smartwatches in the world to use an e-Strap, which contains buttons that allow you to change through the various settings built into the watch. This strap is also interchangeable so you can adjust the designs according to your outfits or other needs. This smartwatch can be used with both Android and iOS phones and includes settings such as an activity tracker, Find-Me map, and even a high-definition camera. Besides its helpful features, it also has a glossy black and gray housing that has a unique contour feature to help you better view information on it. Lisa has a Bachelor’s of Science in Communication Arts. She is an experienced blogger who enjoys researching interesting facts, ideas, products, and other compelling concepts. In addition to writing, she likes photography and Photoshop.